Bonkers 221PS Ducati Panigale V4 R Breaks Cover! Latest Ducati flagship becomes second most powerful motorcycle after the Kawasaki Ninja H2! Engine capacity has been curbed to 998cc. Lighter than the V4S by 2kg. Will be a limited edition model. India bound expected, although in a very limited run. A premium price of Rs 60 lakh is expected. If you thought the Ducati Panigale V4S wasn't already bonkers, the Bologna-based bike manufacturer has now pulled the wraps-off the absolutely mental V4 R. And yes, the 'R' here stands for race-spec. So what's new here? For starters, it won't be a mass-production bike. Instead, Ducati will be launching the bike as a homologation special so that it can introduce it at next year’s World Superbike Championship (WSBK). 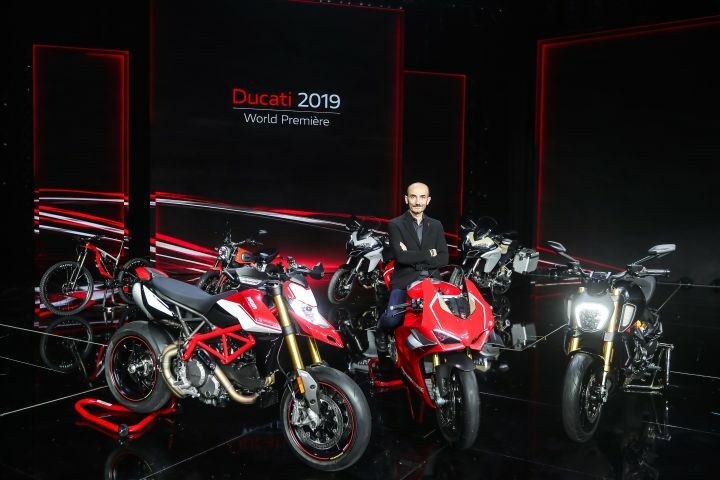 The road-legal version is expected to be a limited edition variant of the V4 and is likely to ditch some of the features seen on Ducati’s flagship. Naturally, don’t expect to see a lot of them on the road. Of course, to turn the V4 S into a WSBK race machine has led Ducati’s engineers to downsize the standard Desmosedici Stradale 1103cc to 998cc. However, Ducati has used a bunch of performance-enhancing modifications to make up for the loss in displacement. The modifications range from new lightweight engine components to a dry clutch and even electronics from Magnetti Marelli. The bike now runs on forged magnesium Marchesini M9RS wheels, while braking is provided by the same Brembo Stylema calipers as the standard bike. This has led to a power output of 221PS, making it the second-most powerful production-spec motorcycle in the world after the venerable Kawasaki Ninja H2 (227PS). If that’s not enough, this number can be further boosted to 234PS with an Akrapovic race exhaust system. Thanks to an improved air intake system, the redline is now 2250rpm higher at 15,250rpm. It now revs quicker, higher and makes a whole lot of power in the process. However, due to the decrease in the engine capacity, torque is now capped at 112Nm from 124Nm. While the chassis remains similar to the stock bike, Ducati has made some serious modifications to the rear sub-frame. It is now much shorter and sheds all the unnecessary elements. Changes have been made to the fairing as well as it now inclines forward and features some extra cutouts for improved aerodynamic prowess and better heat dissipation. Ducati has even employed aerofoil appendages by gathering knowledge from its MotoGP prototypes. Made from carbon-fibre, they help in increasing the stability of the ride. At 193kg, the Ducati V4 S is lighter than the already lightweight V4 S by 2kg! As mentioned earlier, the Ducati V4 R will not be a mass market bike like the V4 and the V4S. Hence, a hefty premium over the standard model is expected here. Will it come to India? We certainly hope so! Share your experiences with Panigale V4?